While fall may signal the beginning of the year’s real estate sales slump, you aren’t off the hook for the season. In fact, you can take several steps to beef up your marketing game throughout autumn as you work to keep your sales steady through the coming months. Are you ready to get started? If you have customer relationship management (CRM) systems in place, paying attention to any leads is beneficial to see your real estate business prosper. Don’t think of this system as merely a way to store phone numbers and names. Now is a good time to upgrade your system if your current option isn’t working for you. Your new system should be accessible for your mobile devices, customizable, and easy to automate for real estate tasks. Upgrade your CRM system now to handle the barrage of clients you expect next spring. Sending postcards to previous and potential clients reminds them of the equity they have built in their homes, providing you with another way to reach out. In fact, these postcards could be the prompt to get them to consider selling. Fall-themed community events bring together clients from the past, present, and future. The possibilities are endless, from pumpkin carving contests and baking contests to football tailgating in the parking lot of your office while the game plays. For Halloween, you might hold a trunk-or-treat event. These community events make it easy for you to connect with new potential clients on a personal level. You also help instill a sense of community without appearing to advertise too strongly. 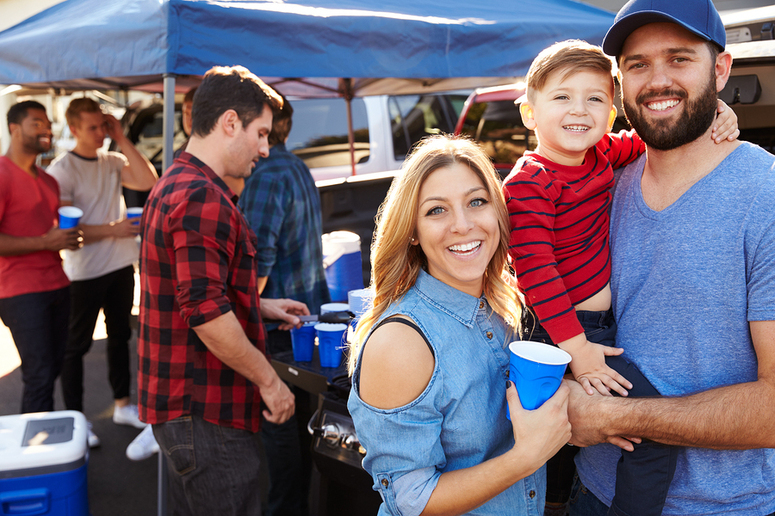 A football tailgate can bring the community together, especially if you have a local team. As the holidays approach, now is a fantastic time to consider giving back to the community in the form of volunteer work or a canned food drive. When you ask for canned food donations, you can bring a flier with a business card attached. Now is a great time to focus on sprucing up the properties you are trying to sell this fall. Keep up the curb appeal of the home by raking up dead leaves and debris regularly. Cut back anything that stopped growing after summer and use the changing season to create a compelling environment with new flowers, especially mums and marigolds. Clean those downspouts and gutters before slapping on fresh paint and maintaining the roof. Don’t forget to secure an HVAC inspection too. Fixing HVAC problems before the home hits the market is ideal. Business slowing down gives you the perfect opportunity to return to real estate school. If you still have credit hours pending to renew your license, take advantage of a real estate slump to take courses that will help you prosper when business picks up again. Are you ready to take courses? You will find many options available to meet your licensing needs. Choose your state now! Video marketing is becoming one of the most popular means of advertising real estate services, prompting many real estate professionals to take note. Could video marketing enhance the experience of your potential clients? Will it facilitate better responses? With real estate training in marketing, you may find more leads, more replies, and more referrals coming your way. Video email marketing uses video to convey the meat of the message rather than text. This means you can add more personality to your videos whether you are creating listings or showing clients around the neighborhood. Video marketing is effective because it puts your face on your brand, humanizing you and your staff members. Video also creates a personal message, preventing you from coming off as cold because you can better use tone and body language to emote. Your clients will also appreciate knowing you put effort into your emails. You are not simply using a template or passing your marketing duties to an assistant. Your clients like knowing the message is coming from you. Video marketing also allows you to create content with different topics to appeal to potential clients. You can truly make an impact on the viewer. One of the best ways to create effective video marketing materials by using many styles of content. You can develop an understanding of what content your clients want by paying attention to the comments and questions people leave for you. You can also create video Q&As, blog post recaps, and advice videos. When you have special offers or events, you can make promotional videos too. The content you create should be mostly evergreen, meaning that it can be used for years to come. Evergreen videos might include exploration of nearby neighborhoods, interviews with homeowners, and local historical information. You don’t need to sell a listing in every single video. Your clients will be delighted to open your marketing emails to find fun, engaging videos. Next, make sure to bring your style and voice to every video you make. Engaging with your clients and potential clients is crucial. You can be professional without being clinical by offering personality, engaging stories, and personal examples from your career. The technical aspects are as important to video marketing as the creative ones. For example, you should always shoot videos in wide-screen rather than portrait mode. If you use your phone to film, flip it sideways first. Most people prefer to watch videos in this mode. You must also pay close attention to the lighting. Your videos should be personable but not unprofessional. Keep the shadows off your face with good lighting. Finally, consider taking another real estate training course to brush up on marketing techniques for your industry. Training can truly help you take your marketing emails to new levels. Start your training today!